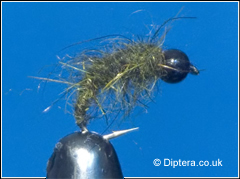 The fly can be fished on stillwaters or tumbling streams from the first day to the last. Can be fished static, dead drift or even used with a figure of eight retrieve. Place a 2mm Bead at the eye of the hook shank, secure the bead with a piece of copper wire bent into a loop and tied down the hookshank with thread. Wrap the thread down the hook shank to a place well into the hook bend. Create a thick rope of dubbed hairs ear and wind the dubbing up the hook shank to the bead.